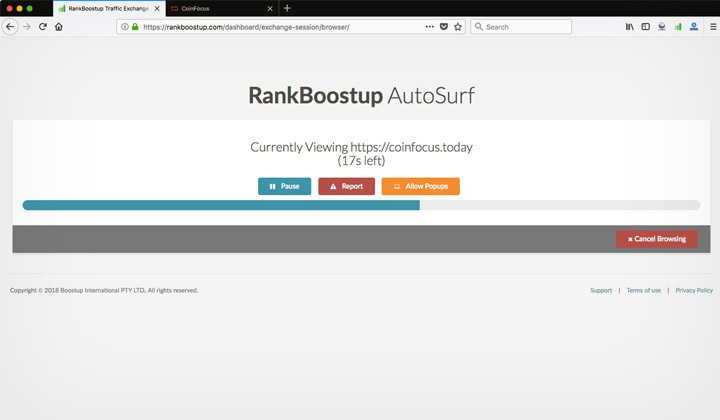 This is my review of the RankBoostup traffic exchange, which I tested for traffic quality but found major problems. And what I consider a better alternative. What was the issue with RankBoostup.com? What’s the best RankBoostup alternative? To solve the problem of slow and little traffic, the best solution is to use the most popular traffic exchange service for unlimited amounts of unique, real traffic. See HitLeap which is the biggest traffic exchange program in 2019. Located at RankBoostup.com, this traffic exchange service has both free and paid versions. 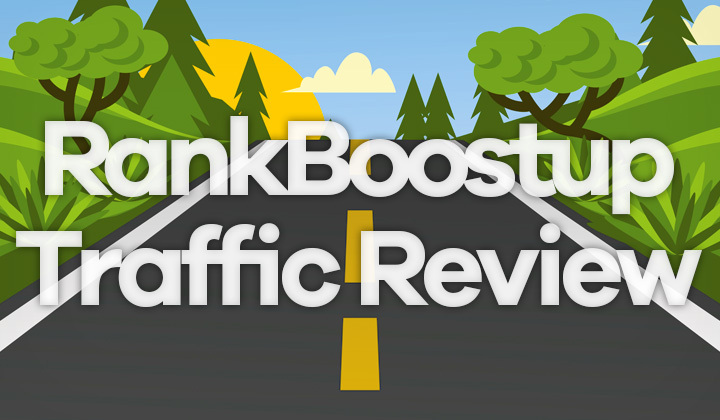 The one I tested was the free version and according to RankBoostup, traffic will become faster by upgrading to a “premium” membership for $7/month. Considering how few visitors I managed to squeeze out of the free version, I am doubtful if paying for a premium membership is going to make much of a difference. It certainly looks like they are lacking enough users to make it work. So I’m not going to use up too much of my time on this review, but explain the reason why I passed on their services. And why not if there are better alternatives? The service is similar to many other traffic exchange services. You run “traffix exchange sessions” which use your internet connection to visit other users websites. You need to first install the boostup browser addon, and activate alexa toolbar. And then first go to Alexa.com to validate your browse, reading for “AutoSurf”. Visitor duration between 10 to 60 seconds, constant or randomized. Then you launch the traffic slot and watch traffic come to your site, for as long as you have minutes left. Which you can also purchase separately. I collected 500 minutes and assigned them to a traffic slot for a website of mine, and it took a total of 18 hours to receive 92 visitors which used up all the minutes. I had set each visit to 30seconds per view, which should amount to 250 visits (500 minutes). That is 36.80% of the traffic I ordered that actually landed on my site. And I don’t think it was a problem with my website, it was hosted on one of the leading datacenter in NY. Looking at the stats, the average load time for the page was 0.67s. So 30seconds should be enough to load the page in it’s entirety. The other concern I had was that you collect hits by installing a browser extension or add-on “alexa toolbar” and then running the “traffic exchange session” used to collect minutes directly on your web browser. There is no separate app. I was surprised that it was able to recover from errors, it’s probably the best browser based traffic exchange program I’ve seen. But this means that you will want to have a separate browser running on your system which is not that convenient. Alternatives have purposely built light-weight viewer apps for easier use, and more stable performance. User friendly just means more users, something essential for the success of any traffic exchange service. And I doubt RankBoostup has that many. There are many potentially great features, if they would have a huge user base, such as geographically targeting visitors (geotargeting), custom referral URLs, etc. Also I was pleased that you could launch traffic programs immediately to start receiving traffic, so they don’t make you wait which is good. And as I said, it’s the best browser add-on/extension based system I have ever seen. It mutes sounds so it doesn’t bother your work and recovers from errors. For a batter alternative, you need a service that offers pretty much RankBoostup does, but also features an easy-to-use application for collecting points. And one, that is realistically possible to use for free. The third ingredient is a huge user base. And it’s surprisingly difficult to find one that has because these services don’t release realistic numbers of active users. I’ve tried loads of traffic services but HitLeap works the best. Because you can get unlimited amounts of geotargeted traffic, from unique, residential IP addresses. It’s completely safe to use for pretty much any purpose. Have fun and stay safe generating traffic for your websites! Questions about RankBoostup.com and their service? Or just have something to share about free traffic exchange? Please, fill in the input field below. Tim. Tremendously huge thanks for your visit, and potential support by clicking some of the affiliate links placed within some of the posts. This is voluntary and just helps me out so much. Really grateful here! Cheers. Thanks for the nice info. We have also tried RankBoostup and get the same result. Now as per your suggestion we are testing HitLeap. Thanks for letting us know. Best of luck! Sorry to hear you’ve had a bad experience with them. Not paying out affiliates is bad for business, yet it happens. But I would still leave room for hope that perhaps they’ll sort out the issue eventually..! Thanks for letting us know.